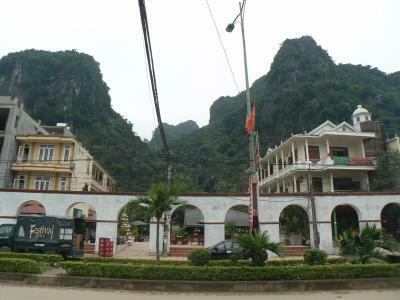 Lock in a great price for Easy Tiger Phong Nha – rated 8.9 by recent guests! Staff was great, it was a friendly atmosphere without being a full party scene. There's a pool, billard table, games house, hammock house, so many sofas, so really cool premises. The rooms are pretty basic and the mattresses a bit hard but still ok. The staff is awesome and will help with anything. It's a bit of a party place with live music in the evening but everything is quiet after 23pm, which is a nice compromise. 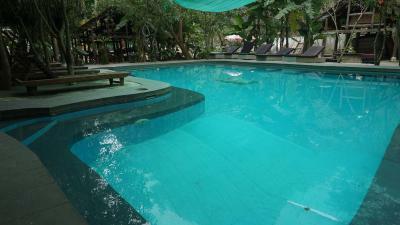 Good faculties, pool table, pool, hammocks Free beer and bicycles. The vibe, common areas Free drinking water everywhere! The food was good and the atmosphere in the common area was great. Loved staying here. Great food and very affordable prices. It’s a place where people come to drink or eat each night! Staff very friendly and helpful. The pool is nice to relax around. 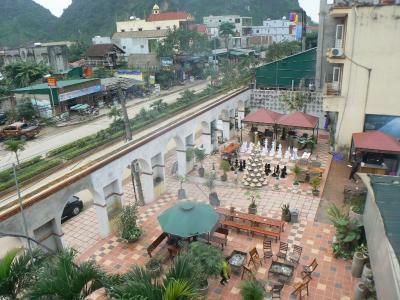 Great location in central Phong Nha with free bicycle rental. Quiet dorms with en suite bathroom. They also operate tours which are very popular to the caves etc. Would recommend to all! Liked the staff, the vibe, the area. Lots of things to do close by. Phong Nah was one of my favourite places in Vietnam. Food was very over priced.. I haven't been to a hostel that isn't though! 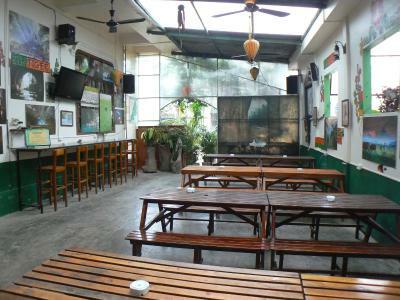 Located in Phong Nha, Easy Tiger Phong Nha features a garden and a shared lounge. Featuring free shuttle service, this property also provides guests with a restaurant. The property has evening entertainment and a tour desk. Featuring a private bathroom, certain rooms at the hostel also offer a terrace. You can play pool at Easy Tiger Phong Nha. The nearest airport is Dong Hoi Airport, 26 miles from the property. 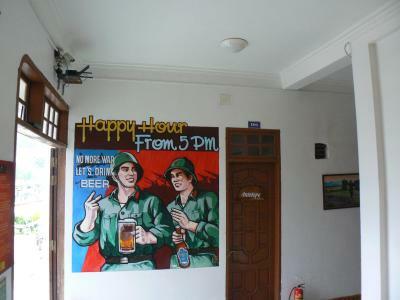 When would you like to stay at Easy Tiger Phong Nha? 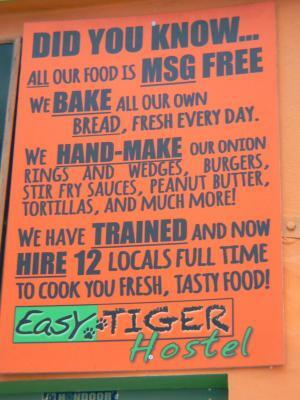 House Rules Easy Tiger Phong Nha takes special requests – add in the next step! Easy Tiger Phong Nha accepts these cards and reserves the right to temporarily hold an amount prior to arrival. Pool was a bit cloudy and lots of stuff floating in it. Comfy beds, booked great tour through them (abandoned valley), food at restaurant nice though a little expensive. All staff really nice. Free beer was good and the happy hour drinks were good value. They had citronella candles burning everywhere which kept the rooms smelling good and bugs away. Big lockers and plenty of space in general. Would definitely return. Bunk beds were a bit shaky. Staff and live music. Good location. While most of the staff were friendly and helpful, I found a couple of them acting like they were tired of dealing with "annoying" guests. Social hostel. Would recommend to other solo travelers. Bathroom floor is almost always wet as there's so separate shower. You get used to it in Asia but I would prefer if they provided a pair of slippers per room. I didn't like the food at their restaurant that much, the banana pancakes were good, the banh mi quite terrible. Although it’s a great place definitely over priced compared to other options in the area. Could at least provide breakfast considering how expensive it is. the bunk beds were comfy. BUT I was on a top bunk it felt so high and the bed wasn't that sturdy, on top of this no like safety railing.. just felt like I was going to roll out of bed. The kindness and energy of the staff!